Most of the time when you cut yourself, your skin is able to heal itself on its own. However, serious cuts can require extra care like stitches to ensure they heal without infection. Next time you find yourself dealing with an injury and wondering, “Do I need to go to the ER for Stitches?” FastMed Urgent Care can help. FastMed has walk-in clinics all over North Carolina and Arizona and accepts Blue Cross and Blue Shield of North Carolina (BCBSNC) and most other major insurance plans. How do I know I need stitches? What does getting stitches entail? 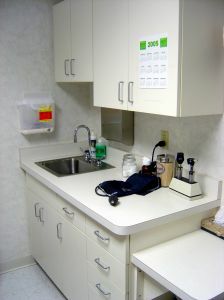 First, a healthcare provider will assess your injury and determine whether or not stitches are needed. If they decide you do need stitches, they will most likely numb the area and sew the wound together with surgical thread. Do I need to go to the ER for stitches? Not with FastMed in your neighborhood! FastMed offers stitches and other services 7 days a week with no appointment and accepts most major insurance plans including BCBSNC. What else can I expect from FastMed? Don’t have BCBSNC? Click here to see if your insurance plan is accepted. Don’t have insurance? We have discount programs! In the past, going to the ER for stitches and other unscheduled health issues was your only option. Now, with FastMed, getting the care you need is quick, painless, and affordable. Click here to find a FastMed in your neighborhood!